This week I'm cheating a little bit, but hey it's my game —my rules. This week's selection has had the shell removed, exposing the beautiful interior. As a child, we found these in numerous quantities and they were one of the favorite meals of my father. His technique was intense and very noisy, but the results were superb! Can you guess what it is? Isn't it beautiful? BTW, no one has guessed last week's yet, so here is your chance to get two points towards the prize! 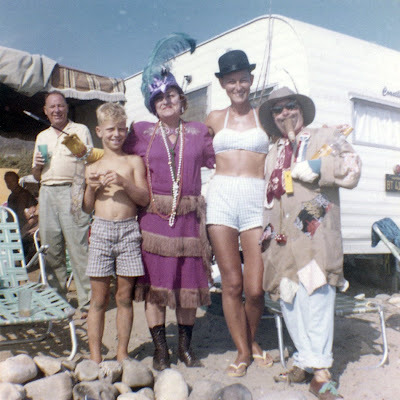 In one of my first posts I wrote briefly about my family's camping trips to the beach. 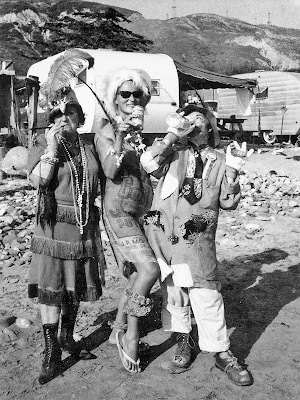 We bought a travel trailer when I was quite young and our favorite trips were, of course, to the beach! 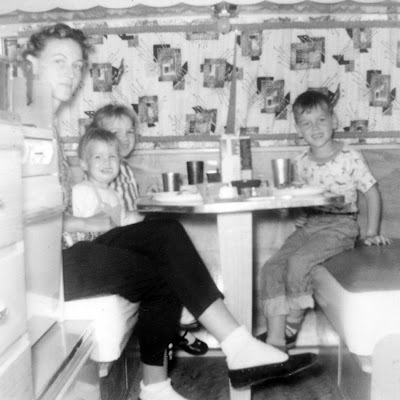 This picture was taken in the dining area of our first trailer in June 1956, shortly before my fifth birthday. I still love camping at the beach, but I have gone from a trailer back to a tent. Keep your trailers and RV's, I love tent camping! 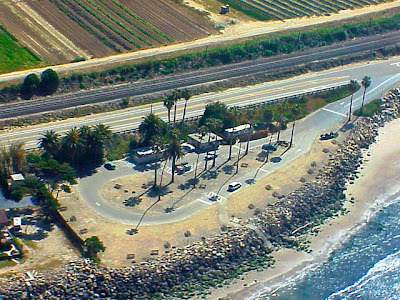 Here is a pic of my campsite at McGrath Beach in Ventura taken in 1995. I don't rough it by any stretch of the imagination! I have a three room tent and an expresso maker for the fire pit. I camp where there are showers and I don't do hot dogs and hamburgers! Food tastes better cooked over a campfire after a day at the beach and I'm all about the food! In the future I'll share with you my recipe and technique for a clambake, it is what I always serve the first night after setting up camp. 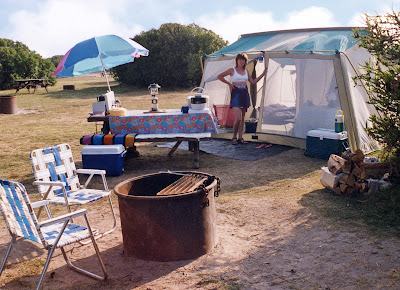 So, there you have a brief look at forty years of beach camping for me from 1956–1995. The last time I was at McGrath was 1999, now I live in Florida and the camping is different here. I've camped at Fort DeSoto, but there are still lots of beaches to explore. 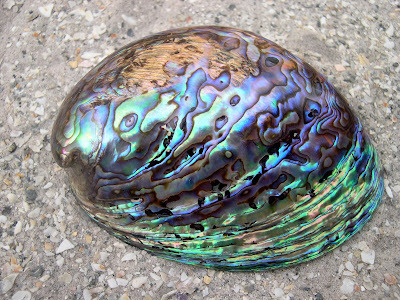 One of my favorites that is getting harder to find along the shore. So, let's see who identifies it correctly this week! Remember, whoever gets the most right answers first in the first 12 weeks wins a mousepad of their choice from my Zazzle store! This is only Week #3, so there's still time. I came to Neptune Beach in the Jacksonville area of Florida to attend their annual Dancin' In The Streets Festival. I'm still dancin', but instead of the streets, we're dancin' in the RAIN! We are starting our fourth day of non-stop rain and running out of things to do. We are water-logged and have grown weary of the downpour. 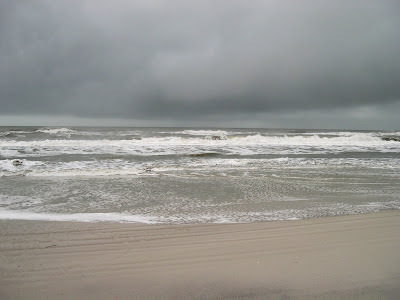 I love the beach at any time, but this continual rain has definitely but a damper on my trip. The rain is across the state, so I'm stuck here until it clears up a bit, which looks like tomorrow or Saturday. I'm not in that much of a hurry to get home; it's raining there also! I did take some pictures on the beach yesterday and will post them when I get home. The waves were powerful and beautiful. I hope you're enjoying the sunshine, wherever you are! Soak up some rays for me. 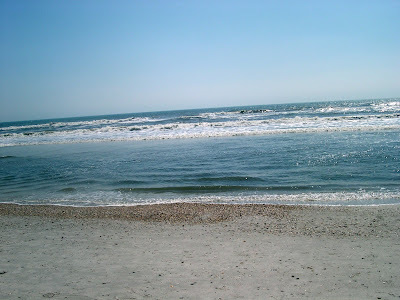 This weekend I'm heading to the east coast of Florida for a little R&R and if you're looking for something fun to do, join me at the 23rd Annual Dancin' In The Streets Festival in Neptune Beach, Florida this Saturday, May 16, 2009. The one-day festival takes place at Beaches Town Center, "Where Atlantic Blvd. meets the ocean" in Jacksonville. Promises to be a fun-filled day of live music, food, art, crafts and a Kid's Zone. I'll definitely be checking out the band Danka at 1:00pm on the Orange Street Stage. The listing promotes them as a mix of reggae, surf and blues. Sounds like a good time to me! Check out Dancin' In The Streets for more info. I'm going to stay on for a few days, but you can bet I'll be blogging about it and posting pictures on my return. Hope to see you there! 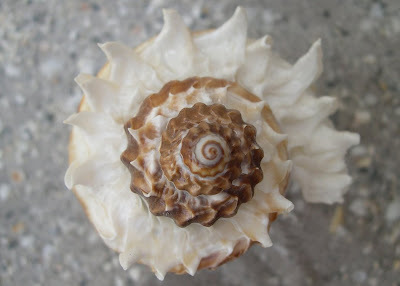 For those who haven't read the comments on the "Seashell of the Week," the winner was my new online friend, David McRee. A link to his Blog the Beach can be found to the right under "Beachy Blogs." 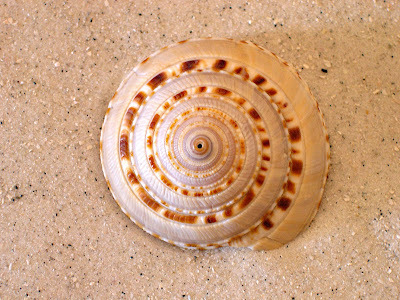 Today starts my weekly seashell identification quiz. I decided to start with something easy that also happens to be one of my favorites. Now you ask, "Will there be a prize?" The answer is yes! 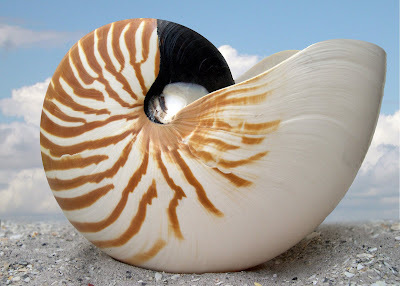 Every three months, whoever gets the right answer first most often will win a mousepad featuring their favorite shell on it! In the case of a tie, there will be runoff quiz. Sound good? Okay, then let's get started! For this first quiz, I only want the common name. If I find out you guys are really good at this I'm going to make it harder! Have fun! Please note: If you are guessing as "Anonymous" there is no way for me to know who you are, so you will not be eligible for the prize. 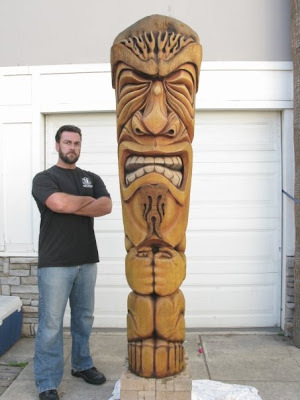 My son who is an incredible artist and photographer, also happens to be an amazing tiki carver. He lives in Redondo Beach, California and loves the beach as much as I do. I want to share a couple of pictures with you, so you can see why I am so proud. Below: Another of his masterpieces. 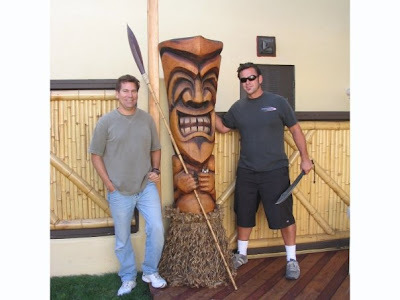 Who looks more menacing, the tiki or Jim? Now don't you agree these are AMAZING??!!!!!!! Okay, I hadn't really planned on writing about the environment — BUT — since saving the environment translates into saving our beloved beaches, I just had to blog about these handbags! 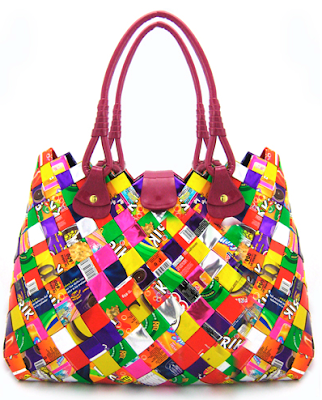 Ecoist handbags are made from recycled candy wrappers, food packages, soda labels, subway maps, newspapers and other waste-bound materials. We collect waste and turn it into functional, durable and eye-catching handbags that you will simply love to own. Shop Ecoist for eco-friendly gifts, accessories, jewelry and much more. They range in size from a coin purse to this one that measures a whopping 21-inches by 14-inches! Wouldn't it perfect for strolling the boardwalk? I should probably let you know that I have no connection to this company and therefore I wouldn't make any money should you decide to buy one, but I just had to share them with you. They are good for the environment and you would definitely be stylin'! I have loved the beach my whole life. Except for a short stint on a river in Arizona, I've never lived more than about thirty minutes away from the shore. Well, the first couple of years of my life don't count do they? By the time I was three my life as a beach girl had begun. I was very fortunate to be raised by parents who passed on their love of the beach to me. 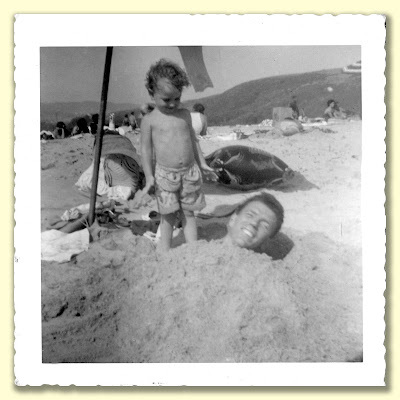 Here's a picture of me and my dad on a beach in Southern California in 1954. This would have been around the Santa Monica/Malibu area. 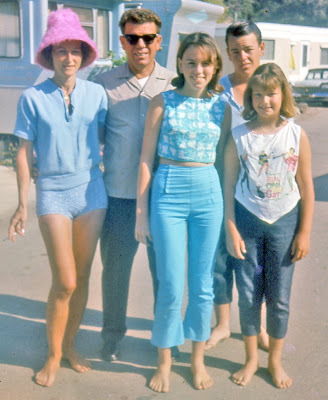 We lived in the San Fernando Valley, but at some point every month we headed to the beach. We bought a trailer and spent many weekends and vacations camping at the beach. 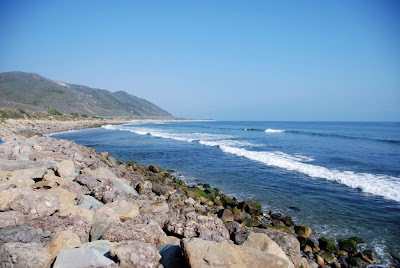 When I was in grammar school one of our favorite spots was Hobson Park, located off Pacific Coast Highway in Ventura County. 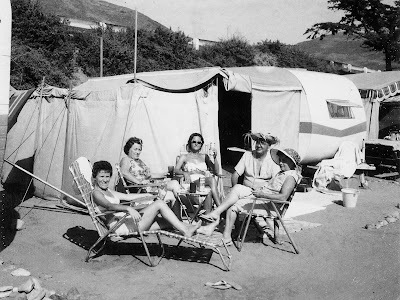 We then moved on to Carpenteria and eventually bought a mobilehome at Paradise Cove in Malibu. By this time I had reached my teenage years and spending weekends and most of the summer in Malibu was a dream come true! I'm pictured here with my parents, my brother Gerald and my baby sister Sandy. I loved the Cove and will be writing about it more in future posts, for now I leave you with this little glimpse into my past. Well, today has been a great day! I started my new blog and while I was busy setting it up I received the "Today's Best Art" award from Zazzle. I've discovered that I love designing Keds shoes and I received the award for my "Flamingos Galore" shoes. I actually like my "Flamingo Love" shoes better, but hey, I'm not complaining!